The World Premiere of ‘Wine Dark Sea’ took place on July 24th 1983 at the Victoria Palace London as part of a concert series. 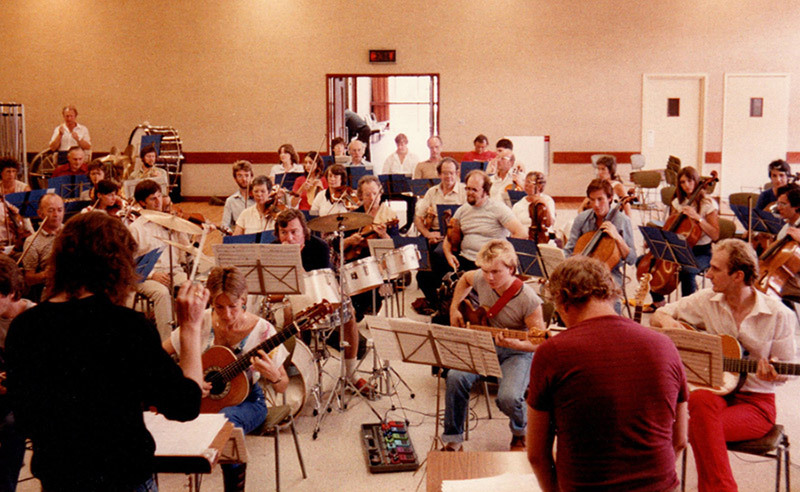 (Photo right) The composers own programme notes give a valuable insight into how this unique work came into being…. The question has been asked of me: “How did you come to write a symphonic rock poem or rock symphony as some people refer to it?” The answer is simple. I didn’t. In a way, it wrote itself. Wine Dark Sea is a natural development in the life of a composer with such diverse influences as Jimi Hendrix, Gustav Mahler and Richard Wagner. It is a work created specifically to place classical/rock guitar music in a highly melodic form into the concert hall/theatre, much as Gershwin did with jazz piano music in the 1920’s and ’30’s. The work is, strictly speaking, a symphonic rock poem for guitar and orchestra. Naturally, such a description demands clarification. Wine Dark Sea is fundamentally a symphonic poem in the tradition of the late 19th century romantic movement, in that it is based on a programme or literary idea. In this case, it is Homer’s epic ‘Odyssey’ with its legends of Odysseus, the Cyclops and the Sirens which is the story from which the title is drawn. A keyboard/synthesizer player, bass guitar and drums complete the line up of the Rock Ensemble. As for the orchestra, the line-up is fairly standard save for the exclusion of a full brass section — the nature of the work does not demand it.